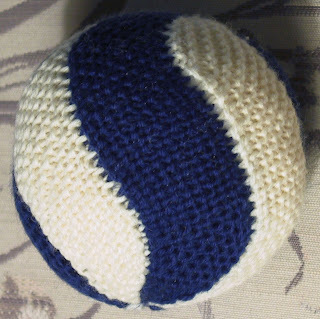 I use two different colored needles of the same size so I know which side I’m on, I had a green needle in my left hand when I was on the right side when I made this ball. Much easier than trying to keep track of what row you’re on. I didn’t bother with markers once I got the hang of the pattern. Right side noted with + and wrong side with –. For first section Row 1: Loosely cast on 30 stitches, turn. 6, k next 16 short row stitches as before, k 5 (–) , turn. and knew that was my last stitch, then made a SRT and started the next row. Continue on like this, knitting up to and including the SRS, then performing an SRT on right sides, knitting to 2 stitches from previous SRS, then performing an SRT on the stitch just before the previous SRS, working your way across the row till there are 15 stitches on your right side needle (5 stitches after you’ve knit the 9+SRS for that row). For this section, k to two stitches before the SRS from the row before, SRS, SRT, do this on the Right Sides and Wrong Sides. Row 42: + k 10 > turn.